The Triumph Spitfire was a British designed and created sports car released during the 50’s and is so often underestimated due to its rather diminutive size. They say that it is never a good idea to judge a book by its cover and in the context of the Triumph Spitfire never before has there been a car that has had such a rich, intriguing and remarkable history as this little car has. When it comes to performance and outright mystique, the Triumph Spitfire punches well above its weight and affectionately dubbed “the bomb” by its creators, the Triumph Spitfire was an instant success with the British market and wowed consumers across the whole of Europe. The Triumph Spitfire was the work of the Triumph Company, a business which had a rather ironic choice in name seeing as it had struggled from day one to turn a profit. Whilst the company had managed to secure a few lucrative government contracts during the Second World War which helped to inject some much needed capital back into the company, this was a temporary reprieve only. As a direct result of ever increasing costs and with creditors now becoming increasingly irate about not getting their due credit, the Triumph Company was taken over by Leyland Motors and during this time the production of the Triumph Spitfire was halted altogether. Given that the Triumph Company had a dreadful track record of costly cars with poor sales records, the Leyland executives wanted to ensure that they kept a much tighter grip on the finances of the company. Legend has it that the only working prototype of the Triumph Spitfire was left languishing in the production workshop before being discovered by a curious executive who was so impressed by it that he ordered an immediate production of it. Other theories claim that the Triumph Spitfire was already prepped and ready for launch, and was rushed out in order to help boost the finances and thus improve the share prices. Whatever the reason, the Triumph Spitfire was released and met with critical acclaim, and even managed to break into the notoriously difficult and fickle US market. 1967 saw the Triumph Spitfire undergo a massive overhaul, and so the Triumph Spitfire mark 3 was released, sporting a brand new look thanks to the raising of the front bumper and other noticeable alterations included the upgrading of the engine allowing the Triumph Spitfire Mark 3 to reach 60 mph in a remarkable 12.5 seconds. Not wishing to rest on their laurels , the Triumph company continued to make alterations, improvements and upgrades to the Triumph Spitfire releasing the Mark 4 in 1971 to stumble across a previously unheard of phenomena: the consumer continued to purchase the Triumph Spitfire Mark 3, even with the various new improvements the Mark 4 had to offer. 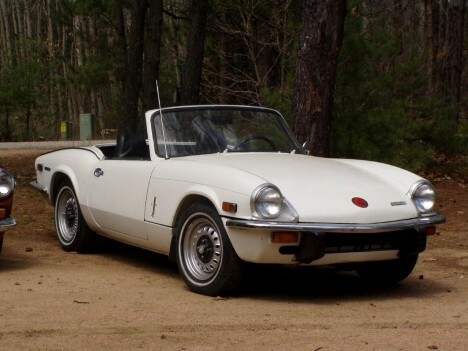 The public fell in love with the Mark 3, and it soon established itself as the best and most popular of all the Triumph Spitfire models to date.